Confused about choosing your next Smartphone between iOS or Android? Today we are going to talk about five points which states how Android is a better choice over iPhone, if and only if you are not an Apple fan boy. Before we go ahead, please note that this is the personal view of App Gyaan team and not made to promote any particular brand or device. 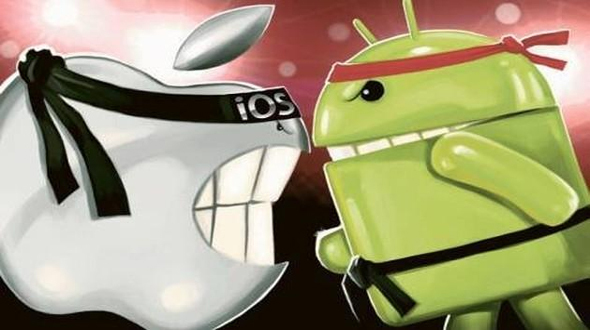 So let’s have a look how Android is better option then iOS. It’s always better to have option to choose from, rather than compromising with a single thing. iOS users suffer when it comes to options. In Android you get lots of device options from different manufacturer with different hardware configuration and lots of customized UI like Cyanogen OS, which have the base of Android with added juice in it. For devices, the range of android devices available in the market is huge and consumer has lot of options to choose from. With increasing number of manufacturer, the options are increasing with every single day. Being an iOS user you miss this power of choosing the device according to your criteria. Android gives you option to customize your device according to your behavior and need, which is a major lack when it comes to iOS. Being an android user I can choose different types of themes, icons and look for my phone while this option is not available for iOS user. Custom android OS like Cyanogen also gives you freedom to customize everything from notification panel to icons and colors according to your likings. This is the power to user, which is a very good add on points for the Android, as the power of customization is in the hand of users, which again lacks in iOS. Easy UI is one of the USP for android from the time it has been launched, with time the UI has been improved and taken to different level. It gives easy to operate option to flexibility to convert things according to your convenience which is not available in iOS. Easy UI gives freedom to consumer especially to the new user to operate the Smartphone in easy way. This feature again is not a part of iOS. Android Device is available in multiple variants and by multiple vendors in different budgets with different hardware configuration. So if you want a Smartphone with any budget, you can buy an Android Device which is not true in the case of iOS. To be an iOS user you need a good amount of money to fund iPhone. Sometime people try to sell their kidney to buy one, jokes apart, but to use iOS you have to pay good amount of money. According to App Gyaan team external memory slots is one of the handy thing that should be available on your mobile. With increasing data and apps that we used on mobile, it is good to have extra space option available on your phone to take the load or share the load of phone. iOS users are deprived with this facility. These are the five points which according to us gives the edge to the android over iOS. Hope you have liked the article do share this with your friends. You can also subscribe to our RSS feed for all the live updates in your Mail Box.